Like the coat! Nice winter look. Oh my gosh I absolutely love this! And I love you! I've never seen a coat like that, and I really like it! Such a chic looking coat! 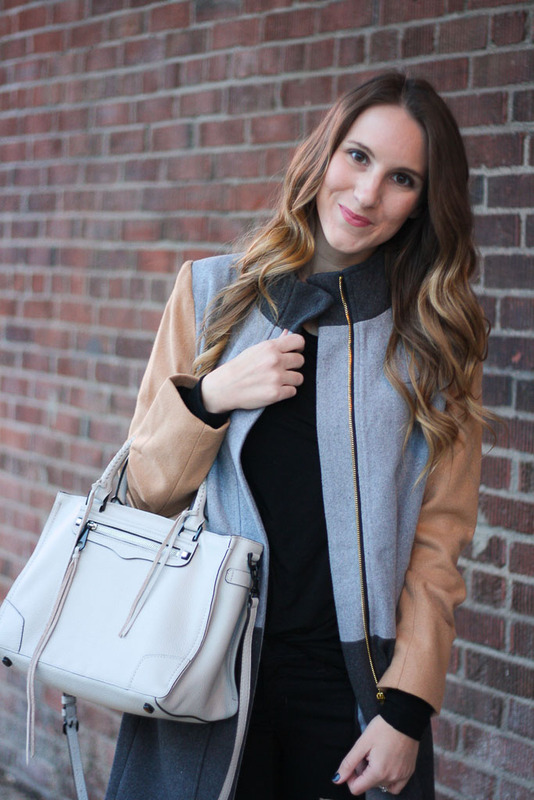 Love all of the different neutrals mixed together! Love the jacket. So unique! Glad you enjoyed your extra day! I did too! Mostly laid around and caught up on my TV shows! obsessed with that coat, and it looks wonderful on you! What a cool colorblock coat! 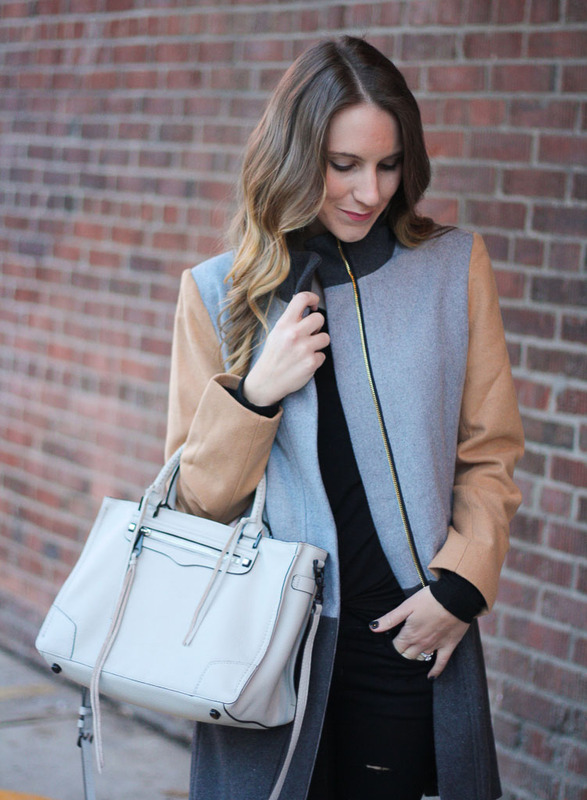 It took me a long time to venture away from buying a black coat every winter. Not sure whether it was due to my OCD tendencies or, like you said, the natural tendency to wear all-black in the cold and dreary wintertime, but I'm proud to say I am now the owner of a blush coat, a trench coat, a bright pink coat (!!!) and several others. I absolutely love your coat. That color is one of my favorites of all times. Who says you have to wear dark colors just because it's winter?! Oh my gosh, this is the cutest coat ever. I'm not a colorful person, but this is too cute to deny. Very pretty! I love the color block jacket and those black jeans!! Wow, I love this coat! Its so unique! I have this same jacket and a I love it. I get so many complements! Lazy days are my favorite, especially after a busy week! I was actually sick in bed this past weekend, and I spent most of it in my PJs rewatching old Disney channel movies and episodes of New Girl. My closet consists of mostly black, so I'm definitely a fan of this outfit. I love the coat with your all black ensemble. 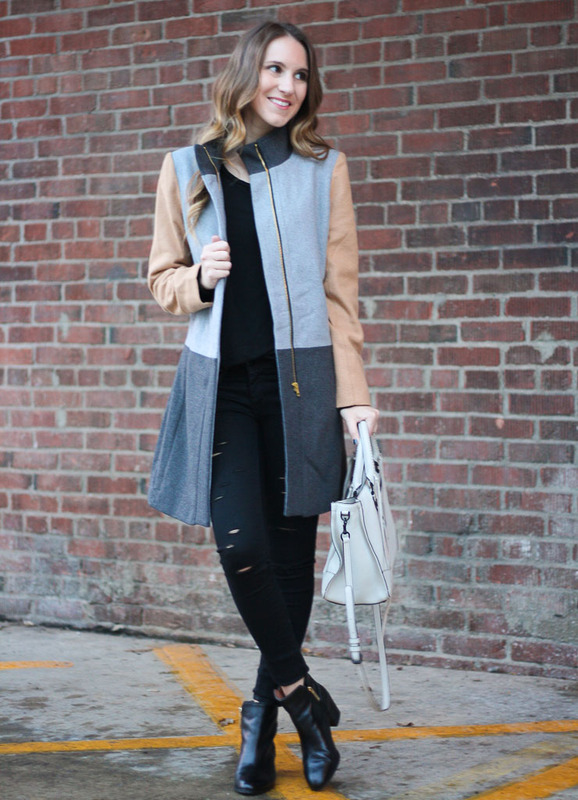 I love the pairing of the colorblock coat with the black ripped jeans and black booties. I'm a huge fan of neutrals, especially black!